For other uses, see David Warner (disambiguation). David Hattersley Warner (born 29 July 1941) is an English actor who played both romantic leads and sinister or villainous characters across a range of media, including stage, film, animation, television and video games. He has a worldwide following for his many appearances in the Star Trek TV and feature-film franchise. 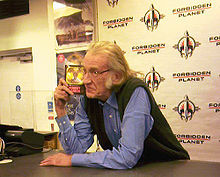 Warner appeared in such films as Morgan – A Suitable Case for Treatment, A Midsummer Night's Dream, Tom Jones, The Ballad of Cable Hogue, Straw Dogs, Cross of Iron, The Omen, Holocaust, The 39 Steps, Time After Time, Portrait in Evil, Time Bandits, Tron, Titanic, Mary Poppins Returns and various characters in the Star Trek franchise including Star Trek V: The Final Frontier, Star Trek VI: The Undiscovered Country and Star Trek: The Next Generation. In 1981, he won an Emmy Award for Outstanding Supporting Actor in a Miniseries or Special for his portrayal of Pomponius Falco in the television miniseries Masada. Warner also played Bob Cratchit in Clive Donner's A Christmas Carol in 1984. Warner was born in Manchester, England, the son of Ada Doreen (née Hattersley) and Herbert Simon Warner, who was a nursing home proprietor. He was born out of wedlock and frequently taken to be brought up by each of his parents, eventually settling with his Russian Jewish father and his stepmother. He was educated at Feldon School, Leamington Spa, Warwickshire, and trained for the stage at the Royal Academy of Dramatic Art (RADA), London. Warner contributed "Sonnet 25" to the 2002 compilation album, When Love Speaks (EMI Classics), which consists of Shakespearean sonnets and play excerpts as interpreted by famous actors and musicians. He has performed in many audio plays, starring in the Doctor Who Unbound play Sympathy for the Devil (2003) as an alternative version of the Doctor, and in a series of plays based on ITV's Sapphire & Steel as Steel, both for Big Finish Productions. He reprised his incarnation of the Doctor in a sequel, Masters of War (2008). In 2007, he guest starred as Isaac Newton in the Doctor Who audio drama Circular Time and as Cuthbert in four of the seven stories in the second Fourth Doctor series. He also guest starred in the BBC Radio 4 science fiction comedy Nebulous (2005) as Professor Nebulous' arch-enemy Dr. Joseph Klench. In all these productions, Warner has worked with writer and comedian Mark Gatiss of the League of Gentlemen, and plays a guest role in the League's 2005 feature film The League of Gentlemen's Apocalypse. He has also performed in radio plays for the distinguished American companies L.A. Theatre Works and the Hollywood Theater of the Ear. In 2005, Warner read a new adaptation of Oliver Twist for BBC Radio 2 (adapted by Neville Teller and directed by Neil Gardner). In 2008, he guest-starred as Mycroft Holmes in the Bernice Summerfield audio play The Adventure of the Diogenes Damsel. In 2009, he was the voice of Lord Azlok of the Viperox, an insectoid alien race in the animated Doctor Who serial "Dreamland". In 2016, he returned as his alternate Doctor in a series of audios where his Doctor briefly travels to the 'prime' universe and enlists the Seventh Doctor's companion Benny Summerfield (Lisa Bowerman) to try and help him save his universe. Warner's Doctor continued his travels with Benny in a second series of audios released in 2017. 1963 Z-Cars Gee Episode: "The Hitch-Hiker"
1963 Armchair Theatre Steve Episode: "The Push Over"
1970 NBC Experiment in Television Dominic Boot Episode: "The Engagement"
1975 Three Comedies of Marriage Bobby Episode: "Bobby Bluesocks"
Hart to Hart Mr. Bowlly Episode: "Two Harts Are Better Than One"
Faerie Tale Theatre Zandor, the Innkeeper Episode: "The Boy Who Left Home to Find Out About the Shivers"
1987 Crossbow The Alchemist Episode: "Vogel"
1988 Worlds Beyond Ken Larkin Episode: "Reflections of Evil"
Father Dowling Investigates Sir Arthur Wedgeworth Episode "The Murder Weekend Mystery"
Captain Planet and the Planeteers Zarm (voice) Episode "The Dream Machine"
Dinosaurs Spirit of the Tree (voice) Episode "If I Were a Tree"
The Adventures of Brisco County, Jr. Winston Smiles Episode: "Deep in the Heart of Dixie"
Mighty Max Talon (voice) Episode "Souls of Talon"
1995 Biker Mice from Mars Ice Breaker (voice) Episode "Below the Horizon"
Iron Man Arthur Dearborn (voice) Episode "Cell of Iron"
1997 Captain Simian & the Space Monkeys The Glyph (voice) Episode "Rhesus Pieces"
Perversions of Science Dr. Nordhoff Episode "The Exile"
A Mind to Kill David Caulfield Episode "Green Wounds"
Superman: The Animated Series Ra's al Ghul (voice) Episode: "The Demon Reborn"
The Hunger Vassu Episode: "Nunc Dimittis"
Batman Beyond Ra's Al Ghul (voice) Episode 5 of season 3, "Out of the Past"
Love & Money Hugh Episode: "Diagnosis: Effie"
Ancient Rome: The Rise and Fall of an Empire Claudius Pulcher Episode: "Revolution"
Inspector Lewis Donald Lockston Episode "What Lies Tangled"
^ "David Warner". The New York Times. ^ "David Warner: An Actor's Life and Art: A Portrait of the Actor as a Young Man". Archived from the original on 27 October 2009. Retrieved 21 March 2007. CS1 maint: BOT: original-url status unknown (link). Retrieved on 26 July 2011. ^ David Warner Biography (1941–). Filmreference.com. Retrieved on 26 July 2011. ^ David Warner Biography. Yahoo! Movies. (29 July 1941). Retrieved on 26 July 2011. ^ J. O'Connor, John (10 September 1991). "Review/Television; A Detective and Sci-Fi in Los Angeles Magic". The New York Times. ^ Four Programmes – In Love with Barbara. BBC. Retrieved on 26 July 2011. ^ Lewis, Rory (2014). "Actor David Warner Exhibition". rorylewisphotography.com. ^ "David Warner". National Portrait Gallery London. ^ "The Blue Hotel (1977)". British Film Institute. Retrieved January 3, 2017. ^ a b c d e f g "David Warner - 18 Character Images".